Within surveillance systems, the image processing and recording computer is the invisible but essential core engine whose performance is key to the effectiveness of the system. For rapid deployment systems used for crowd control, the performance requirements are no less – but the size and the power used are also critical. These cameras need to operate from a portable power source like a battery for days at a time capturing images and storing them for subsequent review and analysis. An example of this involves EyeLynx’s Pharos, an all-in-one High Definition (HD) Rapid Deployment surveillance system with Edge Recording Cluster ERC capability. 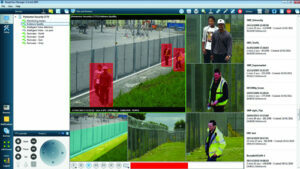 With SharpView NVR software running on a low power TinyGreenPC FitPC2, Pharos records multiple slave HD cameras 24/7 and whenever the perimeter is compromised or a potential intruder approaches too close to the fence, SharpView will send a snapshot alert to the control centre or assigned person’s mobile devices for visual verification. Commenting on the use of TinyGreenPC for the PC platform, EyeLynx Managing Director Jay Patel said, “SharpView records HD video from multiple cameras and processes the images in real time. The challenge was to find a very low power PC, small enough to be hidden in the camera case and able to run for several days from a battery system. EyeLynx features a stand-alone 12V battery power system of 100 to 300Ah with solar/wind charging options allowing rapid deployment. As TinyGreenPC FitPC2 draws 8W this allows the system to run from these batteries for several days without recharging. The TeraByte Hard Disk fitted as standard can store over 30 days of HD video, based on a 1.6GHz Intel Atom CPU, the PC offers more than enough power to run the efficient SharpView NVR software.